lt’s always bittersweet to fall in love with a place that you know will be gone. It’s a feeling I have wrestled with many times in my life, beginning where in grew up in suburban New Jersey. There was a woods, full of sapling maples, poison ivy, honeysuckles and secrets just a few blocks away from the house where I grew up. There was even a high, grassy meadow in the middle of the woods—a magical clearing for kids off exploring and seeking something outside the safety of playing whiffle ball and Frisbee on the street. I took friends to it: It felt like a true adventure for kids hooked on 1970s fantasy novels and sci-fi flicks. You had to work your way through thickets and sneak through manicured yards guarded by drooling German Shepherds to get there. So it was a shock when the bulldozers were parked there. And I confess a few well aimed rocks might have found their windshields—a Jersey kid channelling the pointed outrage of Hayduke long before he ever heard of Ed Abbey. And while I may have stayed my hand from future acts of such active resistance—minus a few days getting hit with pepper spray standing in a human chain in Seattle’s WTO protests—the sinking sadness of that moment has always stayed with me, and I hope fueled a career not of violence but steadfast advocacy for untamed places. I hear it almost every day now when I take my dog out for quiet walks on the University of Colorado’s South Campus near my house in Boulder. The place is a no man’s land in a way, tucked back between the constant hum of traffic racing to Denver on Route 36 and housing developments. It’s a spot a bit off the map for everyone but locals who come here to walk dogs, run, cross-country ski when there’s snow or have long conversations away from screens. High school teams run cross country here and CU has a tennis facility in the grassy wetland. 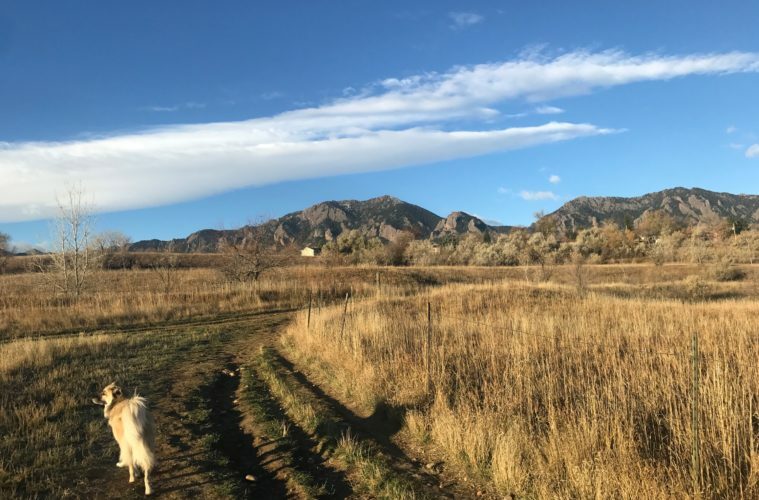 Here, you get big panoramas of Boulder’s Flatirons rising above town and a sense for some of the lost prairie that once covered our continent. You see hawks, geese, sunsets. It also won’t last. It’s slated for development. Here’s the rub. I get it. I know the place needs to be built on and managed. Boulder is growing and as it grows it’s pricing young families and regular working people out. Creating affordable housing is something we need to do to keep our society viable. And the place could easily be trashed without the type of management that ensures that wild spots like Boulder Mountain Parks stay healthy. And this land does not legally belong to those of us who come here. Yet I’m sad for all this land we lose each day as we take over every space on this planet that we share with a multitude of living creatures. We are always losing, especially these small, unheralded, un-built spots. I think of friends fighting in another part of town for an area called Twin Lakes. These are tough fights, the little ones. But what will happen to us when all these mundane wild spots are gone?